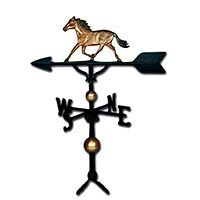 This beautiful weathervane series has a more ornate mast with gold bronze globes. It is recommended for use on a 24" - 30" high cupola, 2-car garage or medium size home. The clutch base will fit most pitched roofs or cupolas. The ornaments are shown in their natural color finish. (The #312 Locomotive is not available in natural color and the #385 Whale is it's own arrow and is only available in satin black). Approx Height 32" x Arrow Length 23 1/4"
Arrow, directionals, mast, and base are baked satin black finish with gold bronze globes. 3" flat base or threaded rod mount available upon request. Ornament number is the last two numbers of the item code.